Shillong, Jul 9 : Former Delhi Police chief Krishan Kant Paul Monday took over as the new governor of Meghalaya. 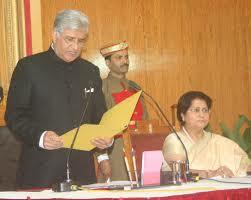 He was administered the oath of office by Meghalaya High Court Chief Justice T. Meena Kumari at the Raj Bhavan here. Chief Minister Mukul Sangma, members of his council of ministers, assembly Speaker Abu Taher Mondal and Leader of Opposition Donkupar Roy were among those who attended the ceremony. Paul, 65, was the Delhi Police commissioner from February 2004 to July 2007 and became a member of the Union Public Service Commission July 26, 2007. He had also served in the Intelligence Bureau and the Research and Analysis Wing. An avid cricket lover, Paul is credited with having cracked the betting racket in which South African captain Hansie Cronje was indicted. The 1970 batch Indian Police Service (IPS) officer is also credited with nabbing serial killer and conman Charles Sobhraj. Married to Omita Paul, who is currently secretary to President Pranab Mukherjee, Paul carries a wide ranging of experience of urban policing and internal security. He was involved in handling a mega event like the Asian Games in 1982 in New Delhi and the Non-Aligned Movement summit in New Delhi in 1983. An MSc and PhD in chemistry from Panjab University, Paul joined the IPS in 1970 and was granted the AGMUT (Arunachal Pradesh-Goa-Mizoram-Union Territories) cadre, under which he was first posted at Andaman and Nicobar Islands and then served as the chief of Arunachal Pradesh Police.